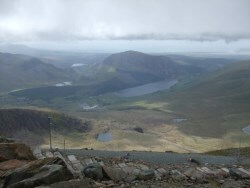 We have just returned from climbing Snowdon! After trying the Ranger path on Tuesday. We had to unfortunately turn back after climbing three quarters of the way up as the weather turned bad with gusty winds and clouds obscuring our path. We were very disappointed as we had planned this in January and had been practicing climbing in the Peak District on Thorpe Cloud. We felt we could not give up although we had already walked many miles on waterfall walks and around Betws-y-Coed. So we went back on Wednesday and tried the Llanberis Path, which we had understood to be easier! After parking the car and climbing the road up to the start of the path (yes it was very steep) we started our long journey. After reaching the Halfway House (which was closed) my partner asked if I wanted to turn back, I did want to but I was determined to complete the challenge, the rest of the journey was very hard and steep to climb. Many others told us we were nearly there as we struggled to keep going, but each time we had a lot further to go! We eventually arrived at the summit, hurray! It was very windy and cold, we had a comfort break with a very welcome mug of coffee. We then bought a certificate each and a hat with details of the climb embroidered on it. The shop then had to close due to weather conditions, as the train cannot ascend or descend in bad weather, the staff traveled down on the last train. We prepared ourselves for the long walk down as the clouds descended upon us, only to be met by a man running on the way up and a man with a baby on his back! It took us a long time to walk back down, but was a great relief to be on the descent. We thoroughly enjoyed our experience and felt we had achieved another challenge even though we were exhausted. We were certainly not the oldest at 50 but still felt good we had done it at this age. 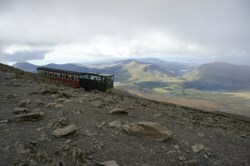 The round trip from and back to your starting point from Victoria Terrace (just up the road from the Snowdon Mountain Railway Station) will be about 9 miles, and will take around 6 hours to complete. The path offers fantastic views - on a clear day you can see as far as Anglesey over the Menai Straits. The path more or less follows the Snowdon Mountain Railway track, so in summer months you can watch the trains making their way up and down as you walk. Before the railway came, tourists used to ascend to the summit via this route by mule. Although less steep than other paths the going can be very slippery when wet, and appropriate footwear should be worn. In winter conditions all routes to the summit of Snowdon should only be attempted by properly equipped and experienced walkers. My brothers were visiting UK for the first time from Dubai and we took them up Snowdon this Easter Weekend. We took the Llanberis Path (novice climbers) and loved every minute of the trek. The sun was out and the views were breath taking. The path was a little steep in the beginning but became more gradual later on until we hit the legendary half-house cafe. However, the next stretch was quite challenging and steep. We continued the accent towards the snow touched peak and wished we had carried less food and started a little earlier. The clouds floated beneath us and the majestic mountains towered by our side. The last half an hour to the top was the most exhilarating experience ever and once up at the summit, we were well rewarded with exceptionally beautiful views, a sense of accomplishment and cheerful fellow achievers. The path was well marked, hence we did not need any compass or sat nav. But we relied heavily on the route map we had printed off the internet, to keep track of our path and progress.